BEIJING, Nov. 6,China will further promote a higher level of opening up with more practical measures and enhance intellectual property protection, Chinese Premier Li Keqiang said Tuesday. 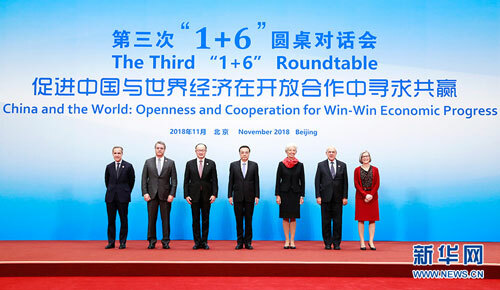 Li made the remarks when holding the "1+6" Roundtable with leaders of six major international economic and financial institutions. "We will further open up with more strength and practical measures, lower the threshold for market access, accelerate the opening-up in the service sector, and allow more foreign high-quality goods and services to enter the Chinese market," he said. "China has always attached importance to intellectual property protection," Li said, adding that the country will never allow forced technology transfer and firmly opposes any restriction on voluntary technology transfer between enterprises. "We will treat domestic and foreign enterprises equally, protect them according to the law and create a world-class business environment," he said.